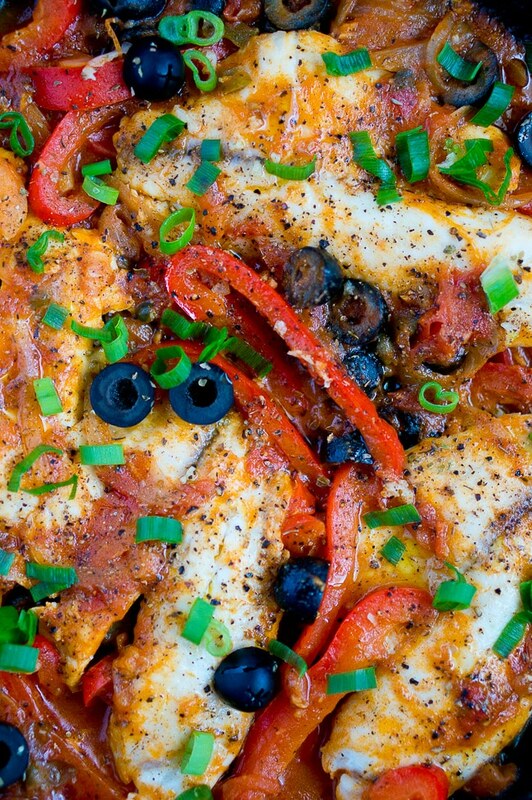 One Skillet Tilapia Veracruz – perfect summer dinner meal, made in only 30 minutes. Paleo. It’s gluten free and grain free. So delicious and healthy! 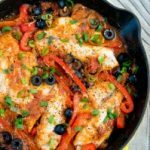 I have the perfect dinner recipe for you today which is a great quick and delicious meal for the middle of the week – One Skillet Tilapia Veracruz. It’s also Paleo. It takes less than 30 minutes to make and most ingredients I use are standard pantry staples. 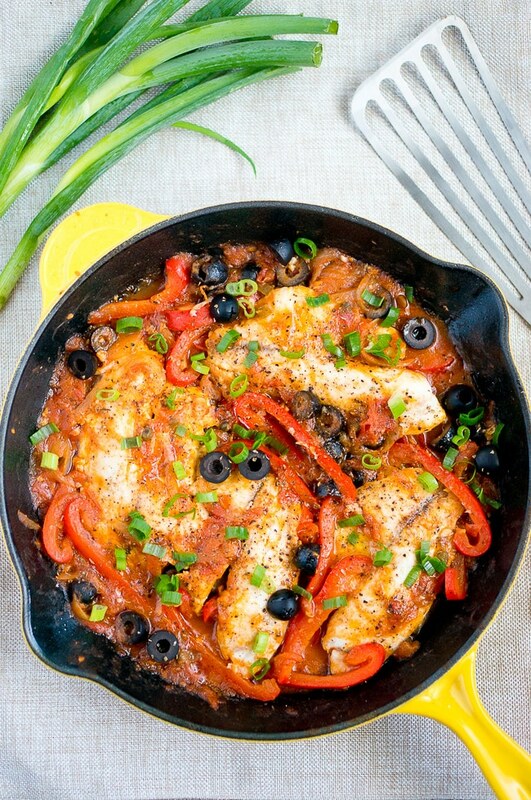 This One-Skillet Tilapia Veracruz is a healthy Mexican dish with wonderful flavors. Its taste is very similar to a lot of Mediterranean meals – pretty much the same ingredients – tomatoes, peppers, onion, garlic, olives, oregano and I also added some jalapeno peppers. It’s only 1 Tbsp jalapeno peppers, and they are cooked. I couldn’t even tell it was spicy, it just adds a nice flavor, so it’s kid approved. The best part is, it’s a One Skillet meal, which means you don’t have to wash up a pile of dishes after supper. One-pot, one-pan and one-skillet meals have become my favorite. The last thing I want to do after work and cooking supper is to wash a sink full of dishes. That’s why I have been sharing with you easy & delicious one-pot meals, hoping that they will make cooking at home easier for you. Hope your week has been pleasant and not too busy! Only two more days till the weekend! Yay! Do you have anything exciting planned for the weekend? Here in Alabama, it’s been really warm these past couple weeks, temperatures have been in the high 90s and with high humidity. But I am not complaining, I can tolerate warm weather so much better than cold weather. 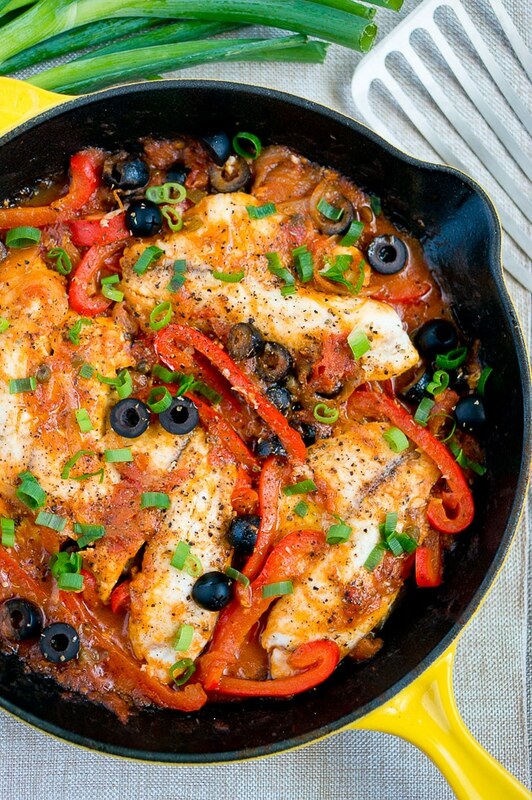 Back to the recipe for One Skillet Tilapia Veracruz. In a large skillet (I used 11.75″ cast iron skillet) heat oil over medium-high heat. Add chopped tomatoes, sliced bell peppers, and onion. Season with salt and stir. Reduce heat to medium, cover with a lid and cook for about 3-4 minutes until vegetables are tender. 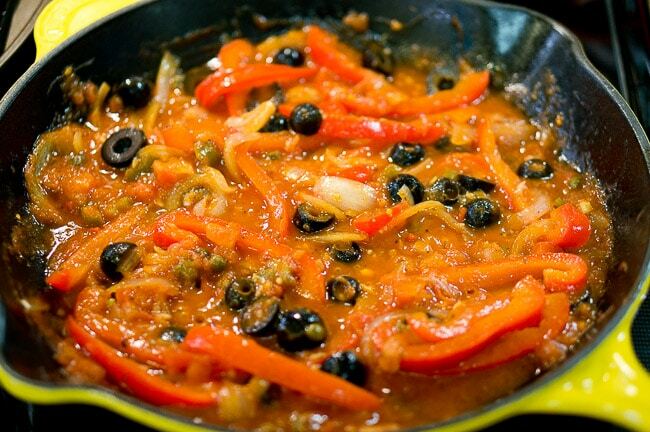 Add tomato sauce, minced garlic, olives, capers, jalapeno peppers and white wine. Season again with salt, freshly ground pepper and oregano. Stir well. Season both sides of tilapia filet with salt and freshly ground black peppers, and place on top of the Veracruz sauce. Spoon some of the sauce on top of the tilapia filets. Cover with a lid and continue to cook on the stove over medium heat for about 5 – 6 minutes, or until fish flakes easily with a fork. You can also serve this meal over rice and add some chopped fresh green onion. Enjoy! 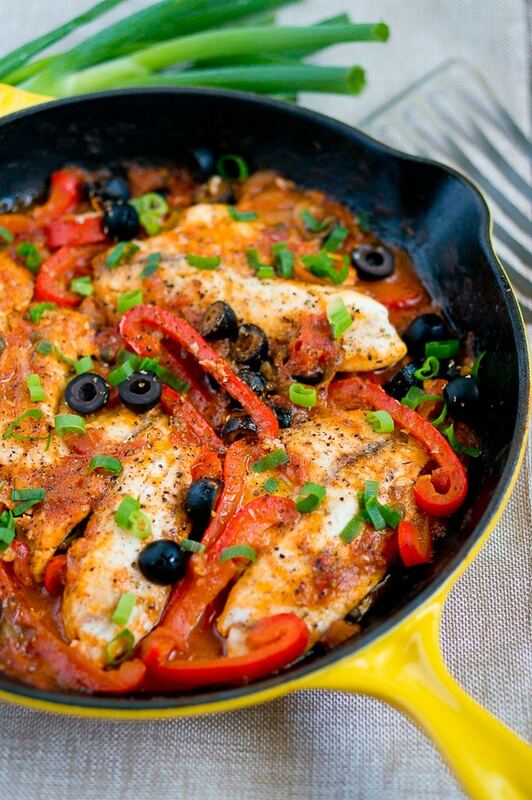 Perfect summer dinner meal - One Skillet Tilapia Veracruz. Paleo. It's gluten free and grain free. So delicious and healthy! In a large skillet (I used 11" cast iron skillet) heat oil over medium high heat. 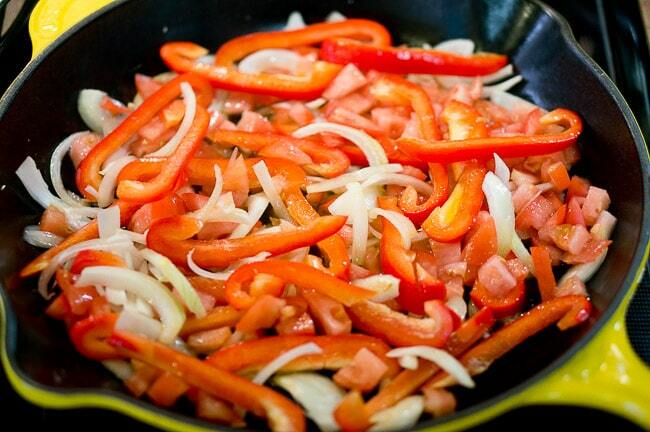 Add chopped tomatoes, sliced bell peppers, and onion. Season with salt and stir. Reduce heat to medium, cover with a lid and cook for about 3-4 minutes until vegetables are tender. Season both sides of tilapia filet with salt and freshly ground black peppers, and place on top of the Veracruz sauce. Spoon some of the sauce on top of the tilapia filets. Cover with a lid and continue to cook on the stove over medium heat for about 5 - 6 minutes, or until fish flakes easily with a fork. love one pot/skillet meals. looks perfect for busy weekday dinners! Now that’s a beautiful one skillet meal Neli! I want some! So appetizing with all those bright colors. Delicious! You are welcome to come over for dinner! 🙂 It’s really a great one skillet meal – quick & delicious! Thanks for stopping by, Allie! I bet those salty capers are a great addition to this dish, and of course, any one-pan dinner is a friend of mine. this is the best recipe! My husband loved it and it’s so easy to make! Delish and super easy! We will definitely be making this again! Great job! I used the entire jalapeño and added some red pepper flakes. We like it spicy ? Thank you for sharing! Just made this tonight and it was easy and super delicious! Thanks for sharing it!! Thank you, Rob! I am really glad you liked it! This was awesome! I did not have any fish, but I did have shrimp so I followed recipe and substituted the shrimp and man it was delicious. Aww, that makes me happy! 🙂 So glad you liked it, Deidra!! Hope you find here more delicious recipes to try. I was wondering if you can substitute chicken breasts with the fish? I’ve come back to this recipe over and over. My fiancé and I love it! YUM! What a gorgeous healthy recipe. I’m always looking for more ways to include healthy seafood in my main dish rotation. Thanks so much for sharing. This looks so yummy! I’m going to make it for Valentine’s Dinner tonight! Already have everything in the house. Thank you to Pinterest for bringing me to your site! I started making this and I realized I didn’t have half the ingredients, but it still came out amazing! I put onion, tomato and red bell pepper, marinara sauce and chicken broth. Some salt, pepper, oregano and the fish on top. I did add more chicken broth so I have some sauce to spoon on rice. It was very tasty and feels light and healthy. Creativity is my best friend in the kitchen as well! 🙂 Love what you created, Donna! Sounds delicious! I have to say making this delicious dish brings me back to my Lovely Veracruz! Thanks so much for sharing one of our traditional dish. Thank you, Evie! I am so glad you like it! 🙂 Thanks for stopping by! Looks delicious. Question? Do you find the acidic tomato sauce damaging to the seasoning in your cast iron skillet? (I thought cooking tomatoes in cast iron was a no-no)? Thanks, Dixymiss! I have heard that too. I rinse & season the skillet after every use, and it still looks like new. I do try to limit using acidic tomato sauces in my cast iron skillets when I can. I would love to make this, but just a question, do I use fresh jalapeños or pickled? I just want to get the recipe correct, I tend to improvise, but for my first time making it, I want to do recipe as is. Great recipe, can’t wait to make it! Neethie, I used jalapenos from a jar. They are pickled. Hope you like it! 🙂 It’s one of my favorite go-to recipes! Any tips on saving leftovers? I’d like to make a bunch but worry that the reheated version would lose a lot. Does anyone have experience to share? I have put leftovers in the fridge and they reheat very well the next day. Delicious! Definitely a repeat recipe. Thank you! I love this fish recipe…a must try!!! Love meals that only require one skillet! I made this dish, is delicious!! I didn’t put capers or jalapeno, instead of jalapeno I put crushed red peppers, and I used sea salt. I will make it again!!! My words….absolutely delicious! Thank you for this great recipe! Wow! Easy and delicious. Husband really liked it, too, which he usually never says about any fish that I make. I have been looking to amp up my fish repertoire and this dish is a great addition. The package of cod I used only had 3 small fillets so I added a pound of shrimp for extra protein…husband liked the fish best and I liked the shrimp. Served w/ vermicelli but thinking rice would have absorbed some of the sauce a little better Definitely a keeper–Thanks! Made this two nights ago. Omg, so delicious! This is a keeper! Thank you! I made this for a family meal and it was delicious! To fit my family’s preferences, I subbed mild chopped green chiles for the jalapenos & sliced baby bella mushrooms for the olives. Topped with scallions as per the photos. 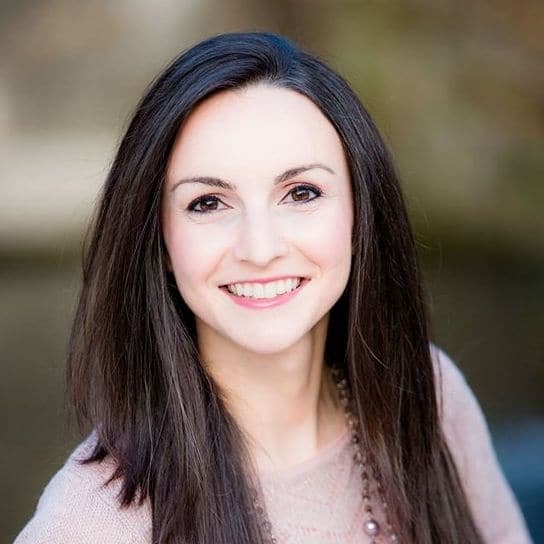 I can’t wait to try your instant pot recipes! Thanks! Wow! Without diminishing the fish, the flavour of this dish is fantastic. Add to this, the recipe is easy.Many thanks.